The GuildBank mod has been renamed to the DKPProfiler. You will need to download the new version below to continue using the automatic uploading capabilities. Installation using the DKPProfiler Installer is fairly straightforward: Download the DKPProfilerInstaller.exe file and run it. 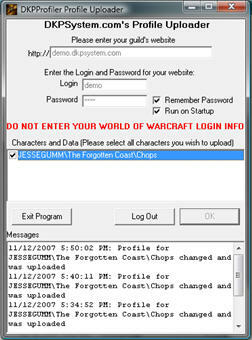 This will install the program onto your hard drive, and when you run the mod for the first time, it'll download the latest DKPProfiler mod and install it properly into the WoW folder. No more unzipping files, and copying folders. When the mod is installed, head to Start > Programs > DKPProfiler and run the program. It's that simple. After logging in, the program will automatically minimize to the "System Tray" like this: . You can click the icon to re-open the DKPProfilerUploader window. If during installation you get the notification that "System Files are out of date..." you'll need to click "OK" to let the system reboot to install newer system files, and when windows reloads, run the installer again. If after reboot, you STILL get this error, then you've encountered a known bug in Microsoft Windows, which can be fixed by following the instructions on Microsoft's Knowledge Base here. After installation, if you get the error that says "Unable to initialize...", after clicking "OK" a browser window will be opened taking you to Microsoft's website for downloading the Core Microsoft XML stuff. Scroll down the page to the "Files in this Download" section. If you are running standard 32-bit Windows or you are unsure what kind of windows you are running, then click "Download" next to the one labeled "msxml6.msi." Otherwise, if you are running 64-bit Windows, download "msxml6_x64.msi". After downloading that package, run it. Once that package is installed (it may require a reboot), simply run the DKPProfilerUploader again from the Start Menu.